VICTOR, NEW YORK – Bristol Instruments, Inc., the leader in wavelength meter technology, has announced a new version of its 871 Series Laser Wavelength Meter. 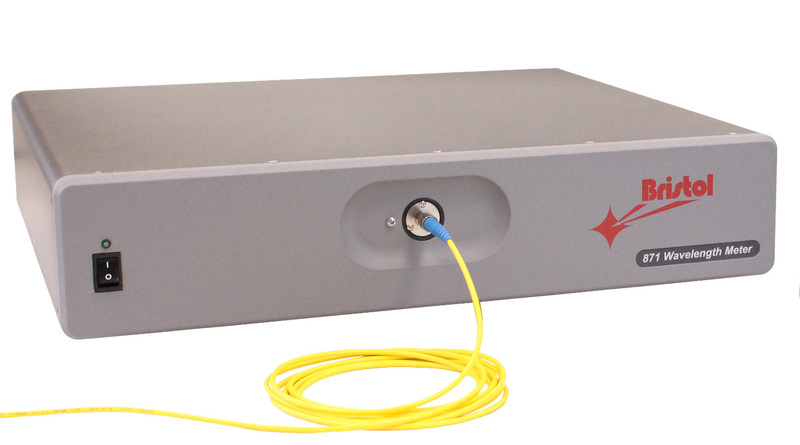 The new model 871B-NIR2 can measure the wavelength of lasers that operate out to 2.5 μm. These measurements have an accuracy of ± 0.75 parts per million (± 0.00075 nm at 1000 nm) and are made at the fastest sustained rate of 1 kHz. The 871B-NIR2 Laser Wavelength Meter uses a unique Fizeau etalon design to measure the wavelength of both pulsed and CW lasers over the range of 1 to 2.5 μm. Automatic calibration with a built-in wavelength standard and pre-aligned fiber-optic input ensure uncompromised accuracy. The system operates with a PC via standard USB and Ethernet interface. Measurement data can also be displayed anywhere in the lab on a tablet or smart phone using a web-based application. In addition, an integrated proportional-integral-derivative (PID) controller benefits researchers who need active regulation of their laser’s frequency. Bristol Instruments is headquartered in Victor, New York. For more information, visit www.bristol-inst.com or call (585) 924-2620.